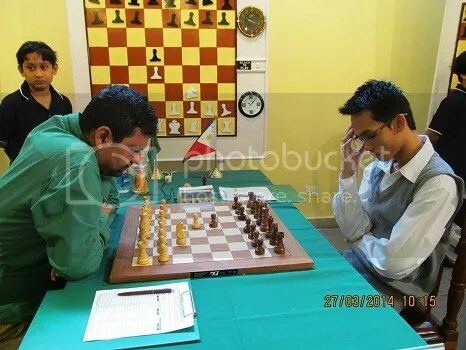 Barbosa, seeded only Nr.11 in this prestigious chess tournament, participated by a strong field of 77 rated players from 13 Federations composed of 55-titled players [27 GMs (7-Super GMs with rating of 2600+), 4 WGMs, 18 IMs & 6 others], enroute to the coveted title had to overcome the odds and completed the 10-round Swiss System “Standard” chess scoring 7.5/10 (+5-0=5) points with an impressive rating performance (Rp) of 2688 and a +15.8 gain in rating points. This bring his “Live Rating” to 2579.8 or a 2580 come April 2014 FIDE rating list just 20 points short for a Super GM status (2600+). His 5-wins (+5) includes crucial won games against 2-super-GMs, Georgian GM Pantsulaia Levan (GEO)2606 in R7 and Russian GM Landa Konstantin (RUS)2645 in R9. 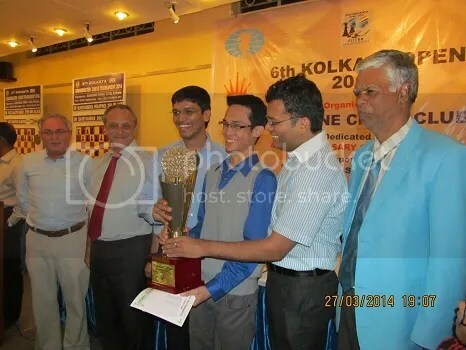 His three other won games were against IM Karthikeyan P. (IND)2355 in R1, IM Swapnil S. Dhopade (IND)2424 in R2 and GM Laxman R.R. (IND)2454 in R5. His 5-drawn (=5) games were against: IM Ghosh Diptayan (IND)2481 in R3, GM Haznedaroglu Kivanc (TUR)2462 in R4, GM Kunte Abhijit (IND)2439 in R6, GM Vidit Santosh Gujrathi (IND)2602 in R8 & GM Rahman Ziaur (BAN)2486 in R10. It was a thrilling down to the wire finish. After the penultimate round (R9), with GMs Vidit and Barbosa winning their respective R9 games, they were both tied at 7.0/9 apiece with Vidit having a higher tiebreak points. In the last round (R10), after GMs Barbosa and Ziaur Rahman game ended in a 38 moves draw, Barbosa waited patiently for the game result between GMs Lalith and Vidit that lasted in 97 moves to get affirmation of his title, as a win or a draw for GM Vidit would have put the Indian on the top. 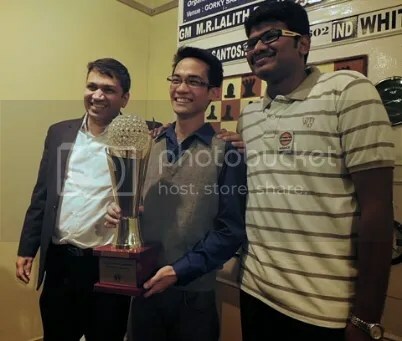 But GM Lalith crushed Vidit’s dreams of clinching the title with a win over his compatriot.